A Renaissance prince looking for instruction had plenty of treatises and manuals to choose from. He could learn lessons in statecraft from Machiavelli’s “The Prince”, or read about how to reconcile piety with power in Erasmus’s “The Education of a Christian Prince”. 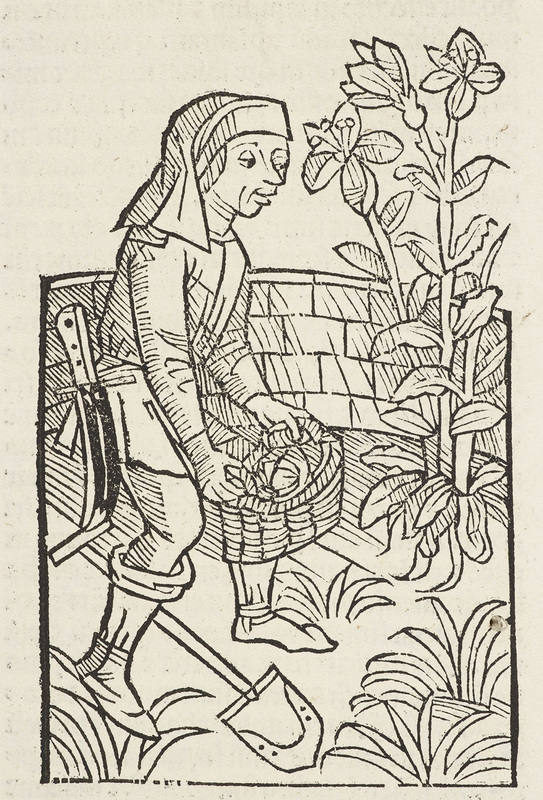 Or, if he was worried that his squash wasn’t growing properly and that his lettuce didn’t taste right, he could turn to “Ruralia Commoda”, a 14th-century gardening manual by the Bolognese jurist Pietro de Crescenzi. 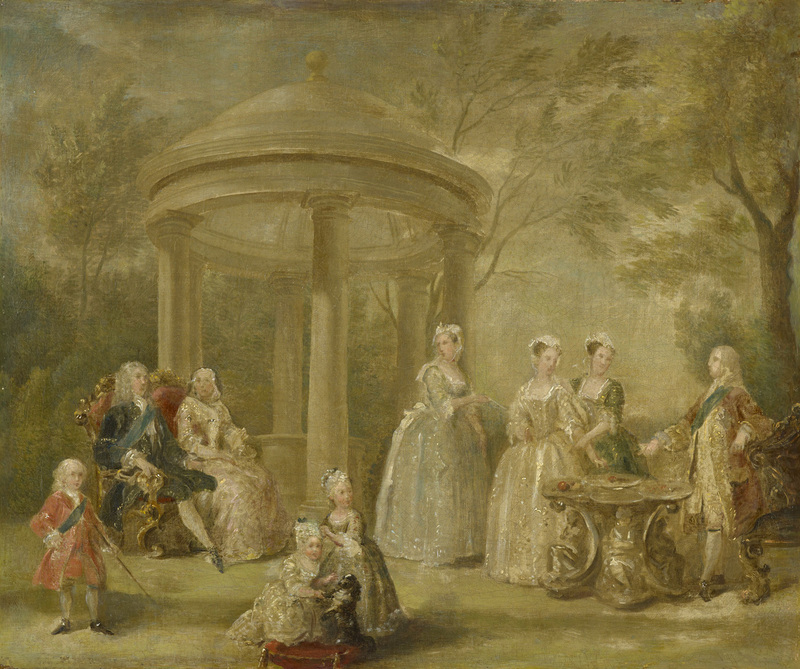 Drawing on classical and contemporary examples, the “Commoda” gives young landowners tips on everything from horticulture (apparently, cucumbers shake with fear at the sound of thunder) to how to make the best use of the royal garden: “the king and queen can meet with the barons and lords when it is not rainy season”. Henry VIII’s copy, a calfskin-bound 15th-century edition, is one of nearly 80 pieces from the Royal Collection that make up “Painting Paradise: The Art of the Garden”, at Edinburgh’s Queen’s Gallery, in the Palace of Holyroodhouse. There are biblical scenes by Rembrandt and portraits by Gainsborough; 16th-century Islamic manuscripts and 15th-century Italian prose romances. There are 18th-century sunflower clocks and 17th-century sundials; Queen Victoria’s orange-blossom parure (a headdress, brooches and earrings) and an illustrated book of verse created in 1607 as a New Year’s gift for Henry, Prince of Wales. Drawn from the world’s largest private collection, the eclectic exhibits are never less than interesting. This is one of six illustrations in the Royal Collection’s oldest illuminated Islamic manuscript: the “Khamsa” (Quintet) by the 15th-century Central Asian poet, Mir ‘Ali Sir Nava’i. 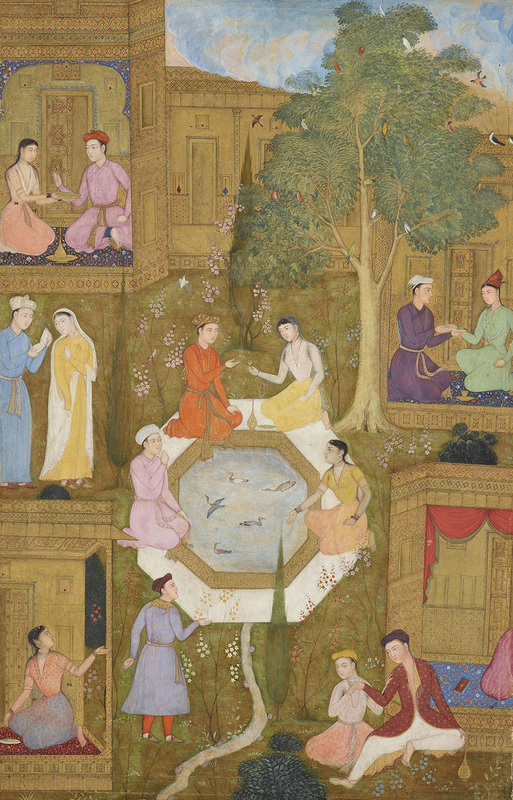 The text of the poem makes clear that the scene depicted is the “Paradise” of Persian King Cyrus II. The Greek historian Xenophon (c.430-354BC) coined the term “Paradise” or paradesios (from the Persian pairidaeza: pairi meaning “around” and diz “to form”) to describe Cyrus’s enclosed hunting garden. The Persians were among the earliest practitioners of modern gardening, their lush walled gardens – with oleander, plane trees and flowing water – an oasis in the middle of the Iranian desert. Symbolic concepts of a Biblical paradise dominate medieval and early Renaissance representations of the garden. As knowledge of classical gardens – and botany – became more widespread, monarchs began to demand classically-inspired designs, and the depictions of gardens in paintings became more accurate. Although the garden here is imaginary, the architecture of the Piazza San Marco in the background establishes the setting as Venice, and the maze and bowers are typical of an Italian Renaissance garden. 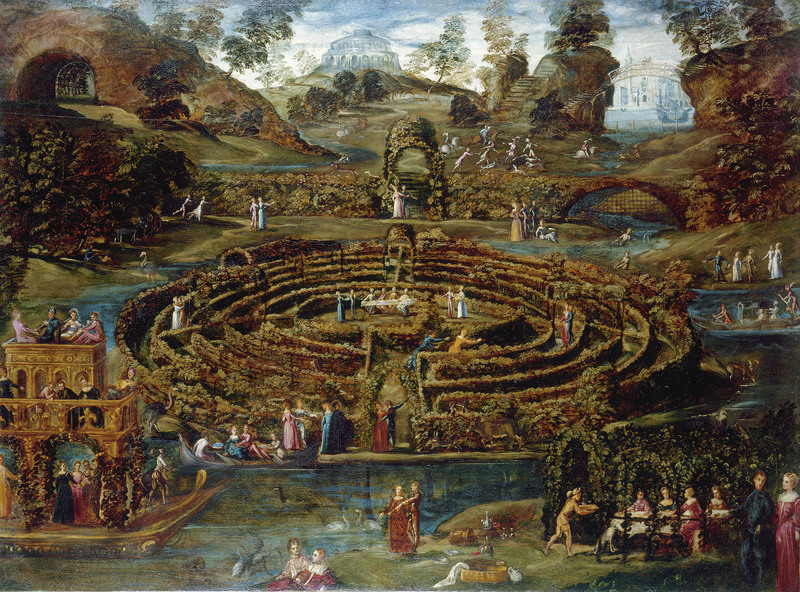 The scenes of revellers eating and frolicking, losing their dignity as they lose themselves in the maze, hint at the dangers of earthly pleasure gardens. Formalised garden design reached its apotheosis during the Baroque period. Land was levelled, trees cleared, water re-routed. The extent to which the landscape was remodelled was a measure of the owner’s power and prestige. 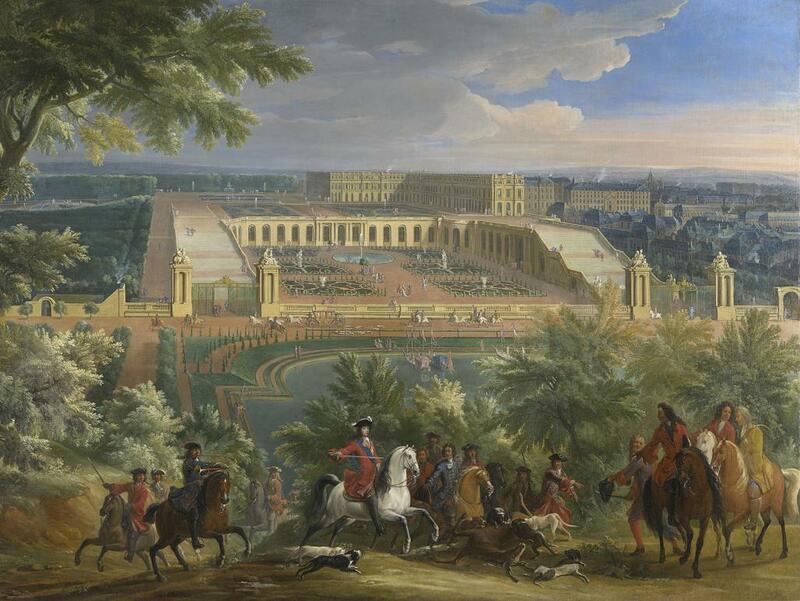 Nowhere was the landscape more spectacularly transformed than in the gardens built by Louis XIV at Versailles. The high panoramic viewpoint here is typical of battle scenes, and the compartments of cut turf and avenues of box hedges stretch out in martial symmetry behind the hunt in the foreground. 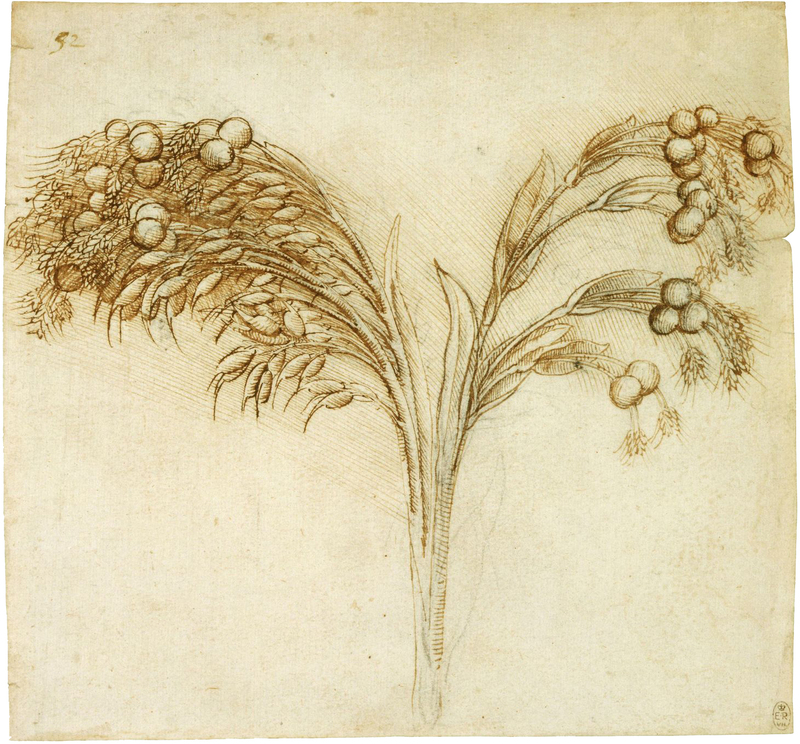 Leonardo’s botanical sketches are as precise as his anatomical illustrations. This is a study of “Job’s tears”, a type of cereal that had recently arrived in Europe from Asia. The drawing found its way into the royal collection by 1690, and was probably acquired by Charles II. 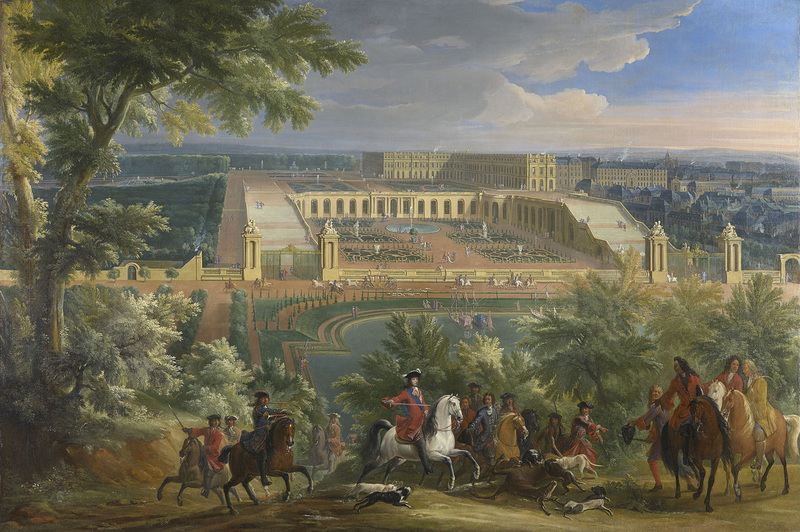 During his exile in France, Charles had been impressed by the gardens at Versailles. When he returned to Britain, he made his gardeners copy their orderly, ostentatious style. You can hardly imagine Hogarth painting a panoramic battle scene, and his less formal approach matches the development of the landscape garden (“England’s greatest cultural export of the 18th century”, according to the curators). Garden design began to follow natural topography and planting schemes, changes associated with Enlightenment ideals of natural rights, particularly with the liberties of the British people. Gardens, like Englishmen, should be free from the arbitrary interference of a continental monarch. George’s consort, Queen Caroline, depicted here, was a leading proponent of landscape gardening. The painting’s most probable setting, Richmond Palace, was one of its finest examples. 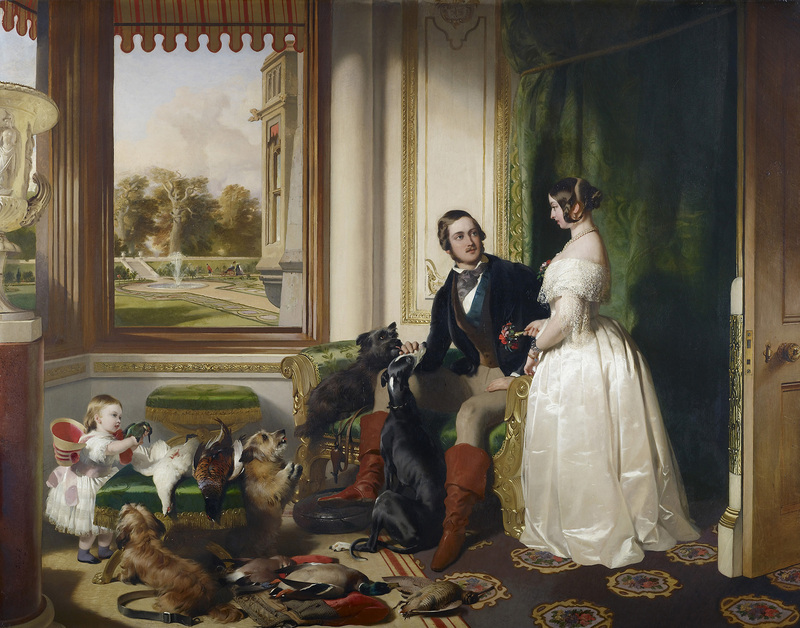 Keen to boost the popularity of the monarchy during an unstable political period, Victoria and Albert deliberately promoted images of the royal family’s home life. Informal scenes like this were meant to emphasise the similarities between them and their subjects, an effort undermined by the sight – through the window – of a liveried servant pulling Victoria’s mother, the Duchess of Kent, around the formal garden in her bath-chair. 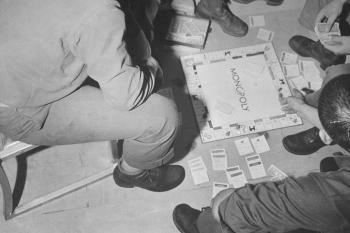 From Monopoly to Settlers of Catan, board games are having a renaissance. Are they getting better, or are we getting more nostalgic?